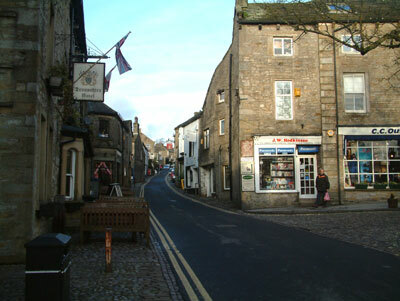 One of the Dales most popular villages, Grassington, in the south of the Dales, is interesting to visit. In its central cobbled street area is a hotchpotch of small shops, pubs, restaurants, tea shops and what might be the tiniest church in existence. Self-expression seems to be the theme here, each of the stone-built cottages and tiny shops offering that something out of the ordinary. Even the residents homes have fascinating objects to look at, from attractive country style porches, weather vanes, stone steps with flowering plants in pots, to creative window displays. It's easy to get the impression that time stands still in the Yorkshire Dales, a feeling of living history. The small well preserved church building shows that it was built in 1694 and remains solid, like many of the other buildings and cottages in the town. Visit the Upper Wharfedale Museum for a look into the past and how people lived in this area. There is also the National Park Centre in the car park for more information about Grassington and the Yorkshire Dales. Just outside Grassington, on the way to Conistone, Grass Wood is an ancient ash woodland with walks. It has a good number of species of birds, wild flowers and animals and will appeal to anyone who likes a nature ramble.